12 February/March 2018 unmanned systems inside *ASSURE is the Alliance for System Safety of UAS through Research Excellence. Air traff ic controllers kept calling for a ground stop every time a drone taxied out of its shelter, fearing a ground collision between drone and manned aircraft. Eventually, control- lers learned to treat drones just like other aircraft that required special taxi procedures. Controllers give gi- ant C-5 cargo aircraft wide separa- tion from smaller aircraft because C-5s can—and have—f lipped lighter aircraft with their engine exhaust. MQ-9/Reapers taxi out like manned aircraft with minimal separation be- cause MQ-9 remote crews use their superb sensors to watch for ground collisions. RQ-4/Global Hawks get w ide separation because they taxi using GPS guidance and don't have sensors that let them see well on the ground. 5) AIRWORTHINE S S/AIR NAVIGATION E Q U I PAG E S TA N DA R D S : CHECK . T he U. S. A ir Force, Roya l A ir Force, Israeli Air Force and NATO all have solid air worthiness standards that the FA A can modif y for large civil- ian drones. Air navigation equipage for drones in controlled airspace is the same as manned aircraft—that is a transponder, ADS-B and possi- bly the Traff ic Collision Avoidance System (TCAS). 6) TRAINING: UNCHECK. Training will need some work. It's one area where you just can't transfer Air Force pro- cedures and expect them to work for civilians. 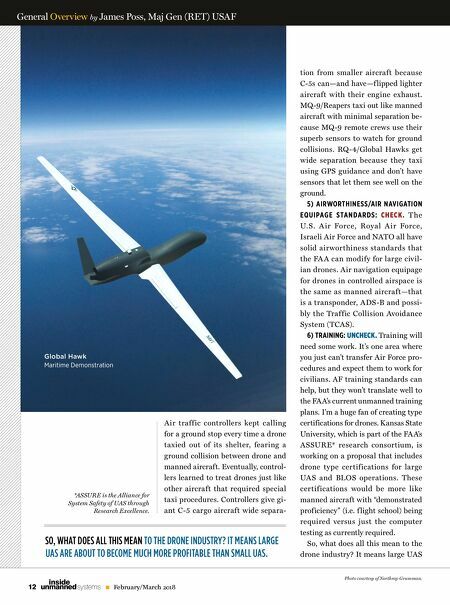 AF training standards can help, but they won't translate well to the FAA's current unmanned training plans. I'm a huge fan of creating type certifications for drones. Kansas State University, which is part of the FAA's ASSURE* research consortium, is working on a proposal that includes drone ty pe certif ications for large UAS and BLOS operations. These cer tif ications would be more like manned aircraft with "demonstrated proficiency" (i.e. f light school) being required versus just the computer testing as currently required. So, what does all this mean to the drone industry? 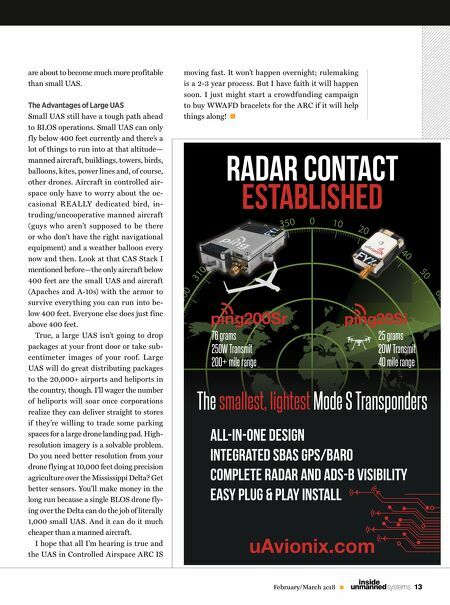 It means large UAS General Overview by James Poss, Maj Gen (RET) USAF SO, WHAT DOES ALL THIS MEAN TO THE DRONE INDUSTRY? IT MEANS LARGE UAS ARE ABOUT TO BECOME MUCH MORE PROFITABLE THAN SMALL UAS. Global Hawk Maritime Demonstration Photo courtesy of Northrop Grumman.